Salomon van Ruysdael was the poet of Dutch waterways, depicting tree-fringed rivers with laden ferry boats, frozen inland waterways with townsfolk enjoying the pleasure of skating, and shorelines with the cargo vessels that were the lifeblood of the Dutch economy. In the seventeenth century, there was less drained land in the northern Netherlands than there is today and by far the easiest means of transport was by boat. Travel along the canals between towns was very efficient; Haarlem, for example, had an hourly barge service to Amsterdam. In the mid-1640s Ruysdael began to paint small works on panel in which boats float on an uncluttered foreground against a vast sky. He developed this theme into the following decade. 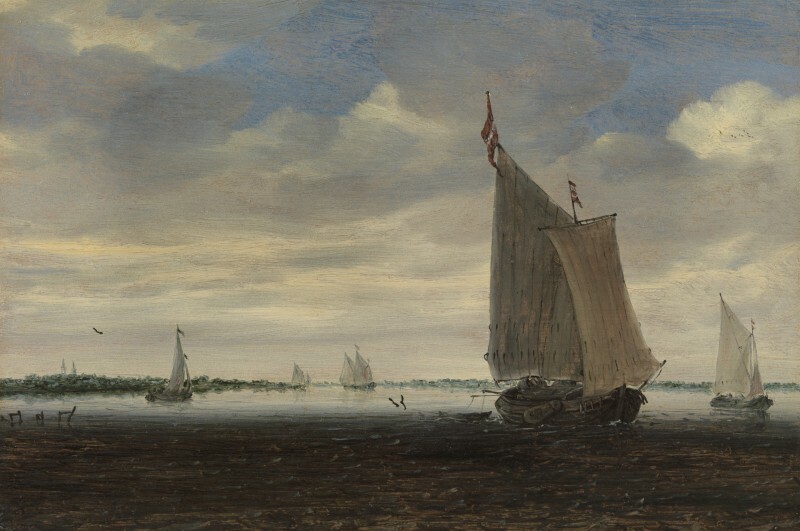 Although comparatively small in compass, there is a wonderful sense of airy panorama in this painting of A wijdschip and other small Dutch vessels on an estuary. The shadowed foreground, painted with quick, flickering strokes, enhances the depth of the composition, while a band of silvery water, lit from the parting clouds, leads the eye far into the distance. A ghostly line of distant sailing boats and two towers defines the horizon. By the 1640s, when this painting was made, Ruysdael had moved away from the ‘tonal’ phase of Dutch landscape painting popular in the 1630s, while still retaining elements of its subtle, harmonious palette. The grey-browns of the foreground water harmonise with the buff and grey sails of the foreground, shadowed boat and with the grey-green of the landscape on the horizon. Brighter, local colours are provided by the red flags on the boat and the intense blue of the sky seen through scudding clouds. Ruysdael ‘draws’ with brush tip to describe the intricacies of the vessels and a couple of flicks of the hand place the three seagulls, one soaring above the left horizon, the other pair dipping down to the point where the silver band of water begins. In contrast to the agitated brushwork of the foreground, the sky is evoked in long, horizontal strokes, blending soft white, warm grey and the faintest hint of pink to suggest a sunset. The painting exudes calm and the classicism that was to come to dominate Dutch landscape as the century progressed. This painting has affinities with Sailing boat and rowing boat, dated 1642, formerly in the collection of Sir Edmund Bacon, Bt. at Raveningham Hall, Norfolk, but is also close in spirit to works such as the Sailing boat on an inland waterway, dated 1650, in the Metropolitan Museum of Art, New York. Salomon Jacobsz van Ruysdael was born in Naarden in Gooiland. He was originally called Salomon de Gooyer (Goyer), but he and his brother Isaack (1599-1677), also an artist, adopted the name ‘Ruysdael’ from Castle Ruisdael (or Ruisschendael), near their father’s home town. Salomon spelled his name Ruysdael (or occasionally Ruyesdael), as distinguished from his nephew Jacob, who used the name Ruisdael. Salomon entered the painters’ guild in Haarlem in 1623 (as Salomon de Gooyer), was named vinder of the guild in 1647, dean the following year, and a vinder again in 1669. His earliest dated painting is of 1626, and as early as 1628 he was praised as a landscapist by the chronicler of Haarlem, Samuel van Ampzing. In a document of 1651 he was also called a merchant, and dealt in blue dye for Haarlem’s bleacheries. His wife, Maycken Buysse, was buried in St Bavo Church in Haarlem on 15th December 1660. Like his father, Salomon was a Mennonite and was listed as such when he was living on the Kleyne Houtstraat in 1669. His religion forbad him to bear arms but he contributed to Haarlem’s civic guard. Although he seems to have lived in Haarlem all his life, he undoubtedly travelled in the country; his paintings depict scenes in, among other places, Leiden, Utrecht, Amersfoort, Arnhem, Alkmaar, Rhenen, Dordrecht and Weesp. The artist was buried in St Bavo’s Church on 3rd November 1670. Stechow, op. cit., p.110, no.280, illus. pl.38, fig. 52. Stechow p.111, no.288A, illus. pl.40, fig. 55.